Pets Costs > How Much Does Catfish Cost? How Much Does Catfish Cost? 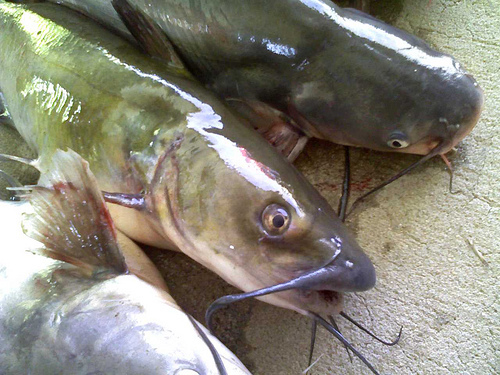 Catfish are known for their barbels which resemble cat whiskers, hence the name “catfish.” Catfish range in size and can be found all around the world from the United States to Southeast Asia. Known as a popular commercial fish, these fish are known to be farmed out and fished for food. The cost of catfish is going to vary depending on the geographical location, size, where you purchase from and time of year. How much do catfish cost? The cost of a catfish can vary from $5 to as much as $300, depending on the breed, but most purchases will be within the $10 to $50 range if you want to purchase the catfish to either raise it in a backyard pond or keep it as a pet. For example, a Tiger Shovel Nose, which measures about three to six inches, can cost $22 to $38. A TSN Hybrid can cost $19 to $29, while a Red Tail can cost $35 to $65. LiveFishDirect.com has a list of available catfish to give you a better idea on how much it may cost. A popular catfish like the Pictus catfish can cost $8 to $14. The Twig, Farlowella and Featherfin can cost $4 to $9. As for food, the costs will depend on the market conditions and store selling it. Most local grocery stores will sell catfish for anywhere from $3.50 to $6 a pound. These are fillets that are already cleaned, processed, and cut up, ready for cooking at home. A local fish market that sells the complete fish without any processing can cost anywhere from $3 to $8 per pound. Catfish fillets or steaks that are already prepared can cost $3 to $7 per steak. For example, BuyCatFish.com sell its steaks for $2 to $3. Refer to our chart below to see what most popular species commonly purchased for a fish tank will cost. Delivery fees may apply if the catfish is purchased through an online retailer. When cooking catfish, look for the white appearance on the outside and check to make sure the internal temperature is higher than 150 degrees Fahrenheit. A simple catfish recipe that many use is by simply wrapping the fish with aluminum foil, placing vegetables inside and baking at 400 degrees Fahrenheit for up to 15 minutes. Other common ways besides baking that taste just as good can include grilling, baking and even deep frying. Each technique has many various recipes available on the web. Consider all different breeds if you plan on having one as a pet. Each catfish will greatly vary in pricing as some are rare while others are somewhat common. Check with the local pet shops to see what they have in stock. It is going to be a lot easier to transport from a local pet shop than to purchase them online and have them shipped to your home.